After a ten year absence, the life-hating super-fiend from Deadworld - Judge Death - returns! Having previously been destroyed by nuclear fire and dragged to hell by the vengeful spirits of those he had murdered, Death has managed to return to world, ready to resume his mission in destroying all life. On his own, Death is a devastating force of evil, but once united with his 'brothers' - Judges Fear, Fire, and Mortis - the quartet of terror are near invincible! 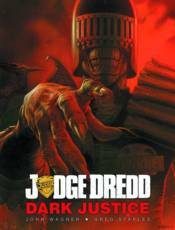 Can Judge Dredd and Psi-Judge Anderson possibly stop the Dark Judges from attempting to destroy Mega-City One again?